Dániel is unwilling to even have the dog in his apartment in the first place, let alone pay money to keep it there, so one thing leads to another and Hagen is abandoned in the street by an unsympathetic Dániel and a distraught Lili who promises to return for her pet friend. Hagen goes from one bad situation to another, from underground dog fighting to risk of euthanasia down at the pound. The final act is a fantastical culmination of the evil poured into the dog by the bad people it encounters, leading the dog to lead a revolution with hundreds of other imprisoned canines. It’s a film that plays like it was made by a Walt Disney that experienced severe childhood trauma. Most likely in Kosovo. For all the film’s beauty (and it is a gorgeously shot film), the pervading sensation when watching is simply one of awe. 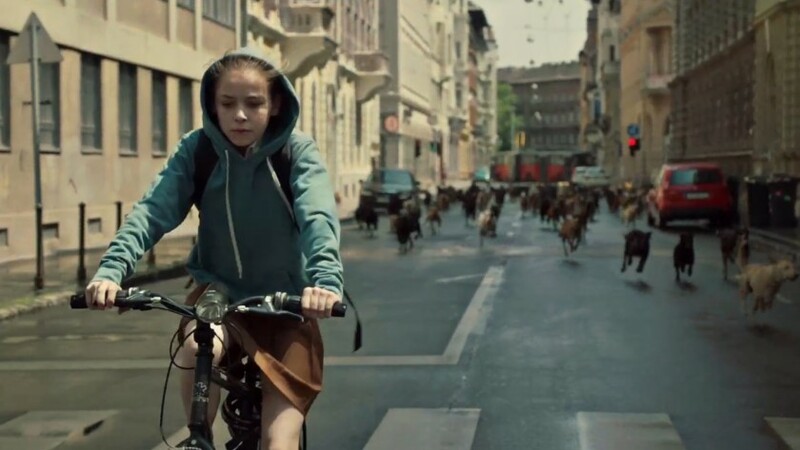 White God breaks records for most dogs featured in one film (the count is at 274), and you’ll be consistently trying to figure out just how the hell they managed to wrangle and control so many of them, considering some of the scenes that exist in the film. It’s a wonder they got anything done with two or three of these animals, let alone 274 – especially when you think about what usually happens when two strange dogs meet one another in the street (that would be all sonic fury breaking loose). Tricks of the theatrical canine trade aside, there’s so much more to be enjoyed here. The simple story of Lili as she charges into puberty head on is extremely relatable, and the slow bond she builds with her father is tempered and slow – exactly what it should be to make it believable and accessible for audiences. The loss of her one friend, Hagen, sends her into that all-too-familiar spiral of acting out in our pre-teens; underage drinking, crushes on older boys, disobeying teachers and parents. Mundruczó puts forward a fine commentary on the loneliness of pubescence. The fact that this familiar, “regular” storyline meshes so well with the mythical element of Hagen’s rise as Caesar of the dogs is a testament to the script and direction. The themes between both story strands are tied together by the inspiring classical score and its echoes within the story, as Lili attends classes Whiplash-style, playing trumpet in an orchestra (at one point the conductor even bellows “Why are you rushing?” in Hungarian). Her trumpet skills also happen to be the one thing that soothes Hagen late at night, when the dog is banished to the bathroom due to Dániel’s unwillingness to share a room with an animal. There’s an enjoyable, fist-pumping revenge element to the film, as the dogs of war (so to speak) exact bloody vengeance on the humans who have mistreated them over the course of the movie. Mundruczó’s main challenge with White God was making the dogs likable, nay, human enough for audiences to engage with. 99% of people love dogs anyway – man’s best friend, an’ all that – so heartstrings were always going to be pulled when they are mistreated within the story. The trick was giving them personalities, especially Hagen. Playful, naive and loyal when the film opens, the worst turn of events turn this sweet animal into a dark, twisted hellhouse mirror of itself. What’s electrifying about it is that we relate to the darkness borne in Hagen after everything the dog goes through – would we turn out any different in those circumstances? Bitter and violent and full of rage? The allegorical elements of White God are all there to be picked up and pulled apart for whomever wishes to do so. Some of them are plain as day; dogs with undesirable genetic qualities are treated like secondary citizens, then rounded up and euthanized. Others are less clear; the canine “revolution” that plays out in the film’s climax can be deemed a success or a failure, and could (should?) be analysed by Political Science undergrads for years to come. Its ambiguous ending will, however, be frustrating for the larger portions of the audience. White God feels like it’s for all the kids who grew up watching All Dogs go to Heaven, who are now a lot wiser to the ways of the world; All Dogs go to War. Don’t miss it. A fantastic, if brief behind-the-scenes where we find out how the dog trainers on board the film accomplished many of the jaw-dropping moments in the film. It’ll be the first port of call for all who watch the feature. There are a good selection of deleted scenes, which mostly negotiate their own excision from the film to make it leaner, and tighter. Still, worth a look. White God is out on DVD now.